The best Lake Michigan vacation awaits you at our home! 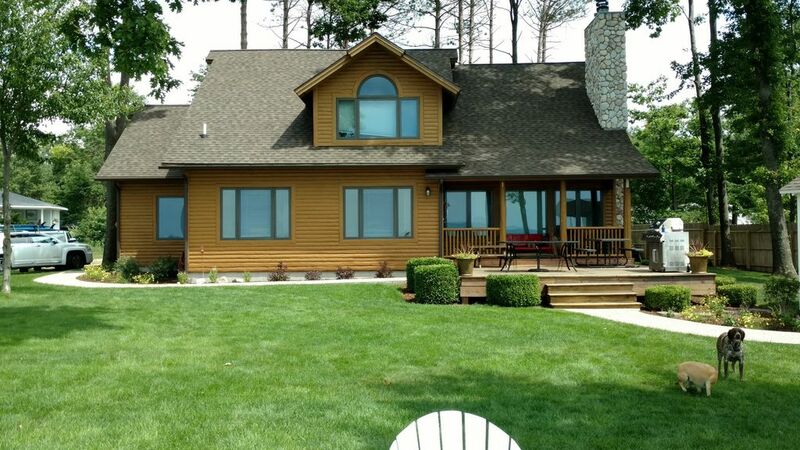 This home is situated on two and a half acres of secluded woods with 100 feet of gorgeous Lake Michigan beachfront. Watch spectacular sunsets from an 18 x 20 deck overlooking Lake Michigan. Just a short couple of steps off the bluff, to the beach, and throw all your cares to the wind. Enjoy our 4 Bedroom, 2 Bath getaway on Lake Michigan. Nitendo video games and additional TV in the Basement for Kids to play with or hook up your own system to it. We had a fabulous time at this wonderful well maintained home. Chuck is very responsive through the rental process. The home is even better than the photos. Our extended family had a great time and the views of Lake Michigan were priceless. Would recommend this property to anyone that wants a great home with wonderful facilities. Don't forget to visit the jam lady (Lois) her jam is wonderful. Thanks to Lois who let our granddaughter choose a pumpkin to carve and her husband kept the men happy showing them round the property!! We just returned from two weeks at this property and we had a terrific time. From campfires on the private beach, to swimming in Lake Michigan, to visiting local sites in Pentwater and Ludington, the time flew by. The house and property were great. The owner, Chuck, seems to be one of the few people left who still understands what customer service means. We stayed here last summer and everyone had a great time. The owner was very friendly and helpful. Everything was beautiful and well maintained. Beautiful sunsets and long walks on the beach. Our grand kids keep asking if we can go back and I am hoping to return next summer. Best home we have rented! Thanks Gloria and we'll always do all we can to make your stay pleasurable and hassle free. If this home shows rented for the time you request, I do have another waterfront home available in Muskegon(Norton Shores) on Mona Lake. VRBO #449714. Please check that listing for availability as well. The CCard Fee is only if you want to pay by Credit Card.